In Gatlin County, things are not always what they seem, as we discovered in Beautiful Creatures. In Beautiful Darkness by Kami Garcia and Margaret Stohl, Ethan is dealing with the fallout of Lena’s sixteenth birthday. Lena has become distant, faced with having to claim herself for light or dark by her seventeenth moon, she pushes Ethan away. And so, we have the set up of Beautiful Darkness. To me, Ethan’s feelings are palpable. He cares deeply about his girlfriend and is left confused when she holds him at arm’s length. I know I have seen reviews complaining about Ethan being too feminine. I will say that sort of thing bothers me. SAY THIS WITH ME: MEN CAN HAS EMOTIONS TOO! Seriously, it is okay for a guy to express emotions AND to have some feminine characteristics. So, I know there will be people saying Ethan was too girly because he was doing the girl thing and feeling sad and emotional, and caring and not running off being constantly macho. Ugh. But this is a rant for another day. I’ll just say I love Ethan’s characterization. To me, he feels real. What I loved about Beautiful Creatures and Beautiful Darkness by Kami Garcia and Margaret Stohl is the style of writing, which is immensely readable. The language is fabulous, but never becomes bogged down in itself. Plus, the descriptions of food, omfg, makes me so hungry. Not to mention the overall southern feel. Granted, I am as Yankee as you can get, sometimes I like to read about the South. Maybe it is TKaM syndrome, where you just know you are going to get a culture that is fascinating. ALSO, shout out to my girl Lucille Ball the cat. For serious, that cat is a winner. She escapes from being tied to a clothesline. Yeah. A cat attached to a clothesline, which sort of sounds like something someone in my family would do. Plus, Lucille gives us a chance to spend more time with the sisters who are awesome. I love the elderly. For serious, they are awesome! Although a certain melancholia lingers throughout Beautiful Darkness by Kami Garcia and Margaret Stohl, I felt it was among some of my better reads. Here’s the thing, it is about teenagers. We all know teens are not always shiny happy people and sometimes tend toward the melancholy. So, yes, I did appreciate that. ALSO, I am NOT team Lena anymore, which is all I will say on that subject. 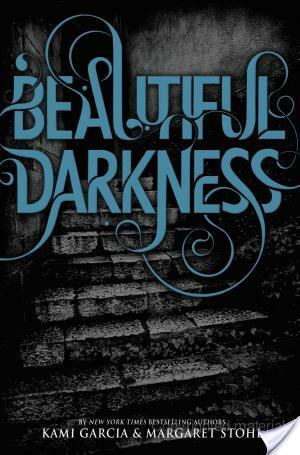 I loved Beautiful Darkness. I still consider myself Team Lena, but I understand why you’re not. I love the writing – it’s very, very slow at times, but lyrical enough to make you forget that it’s dragging. You’re right that there’s a sense of melancholia throughout both books, but I didn’t find it depressing. I think because it’s told from a guy’s POV, that it doesn’t feel as angstsy. I agree with you on Ethan. I never felt that he was feminine, though I understand other bloggers complaints about him never expressing normal male hormone stuff. He just felt mature to me, above that kind of thing. I haven’t read this yet but maybe I’ll pick it up soon. I’m still waiting for Beautiful Darkness but in the meantime, you’ve been tagged! Ugh, I hate it when people think that men are “girly” for showing emotion! Thanks for standing up for him and thanks for the review!